As the massive oil slick continues its approach toward the shores along the Gulf coast, there's growing concern about the danger posed to local wildlife and its habitats. 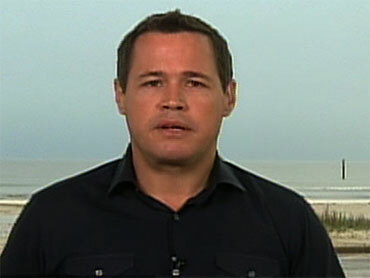 On "The Early Show" Monday, CBS News Special Contributor Jeff Corwin reported from Gulfport, Miss. Corwin said the area, known for hurricanes, is experiencing a similar sense of nervous anticipation before a storm, fearful of losing precious wildlife that is a hallmark of the coast. Corwin reported at first glance all looks serene along the Gulf coastline as rare terns nest in scrapes of sand and black skimmers glide along the water in search of food. But just off shore, he said an unprecedented environmental catastrophe is drifting closer. Alison Sharpe, director of Wildlife Care and Rescue Center, Inc., told CBS News, "(The spill) has the great potential of wiping out the entire population of least terns along our coast area." Least terns were once plentiful on the shores of Biloxi, Miss. At one time, 12,000 of the species lived there. Now only 2,000 terns remain. Corwin pointed out a nest filled with least tern eggs. He said, "It only takes about 20 days for the eggs of the least tern to hatch and another 20 days for the chicks to leave the nest, which means right now, is the most critical period in the life cycle of these birds, when they're most vulnerable." But it's not just the least terns that are threatened, Corwin said. It's estimated more than 400 species would be impacted by the spill. Dr. Mobi Solangi, director of the Institute for Marine Mammal Studies in Gulfport, told Corwin he's prepared to house and treat up to 100 marine animals. For now, his tanks are empty, except for a lone dolphin from a previous rescue. Corwin asked, "If things stay on course and the oil spill hits the way it's predicted to, how will this place be transformed?" Solangi replied, "There are about 3,000 to 5,000 dolphins that are from here to the mouth of the river, so if many of them start coming in, it's going to be overwhelming." On Sunday, a rescue team from Dr. Solangi's center recovered 13 sea turtles that had washed ashore -- an unusually high number. (On Monday, Solangi reported an updated number: He said at least 20 dead sea turtles were found on the state's beaches.) While scientists have yet to determine if oil caused their death, there's concern that the turtles may be the first victims of this oil spill. The Exxon Valdez spill in 1989 left more than 250,000 animals dead. If the oil in the Gulf continues to flow at its current estimated rate, it would take about six weeks to eclipse the Valdez spill. Solangi said, "There was finite quantity with the Valdez, they knew that they had 11 million gallons, after that there was no more, here we don't know." Corwin added, "Up in Valdez, along the Prince William Sound, along the Alaska coastline, the waters were much deeper and the tides were far more rigorous and turbulent, and believe it or not, it had a positive impact on the overall spill. Here (in the Gulf coast), we have shallower waters and it tends to have more of a stagnant effect. So when that oil comes in, it's here to stay." "We don't know is exactly where or when the thick crude sludge will hit the shores," he said. "In areas of Louisiana, were beginning to see oil skim and scientists are left to wait and watch, deeply concerned for the local wildlife." Corwin explained to "Early Show" co-anchor Harry Smith that an animal dies from oil because every inch of their body is exposed to the oil. Dolphins, for example, can die from suffocation, if oil enters their lungs. He added turtles and birds will actually eat food that's covered in oil, which can affect their digestive systems. In birds, also, the oil seeps into their feathers and impairs body insulation, exposing them to cold and making it difficult for them to move. "What we have here is the ultimate Pandora's box," Corwin said. "And as this oil leaks out and and it invades this ecosystem, there's really no way to get it out."